Jefferson Vann reveals the significance of Jesus’ promise of life to the woman at the well. Next, we visited Jesus by night, along with Nicodemus, (John 3:1-21) and learned that this gift would be God’s own Son, who would be lifted up like the desert snake,3 so that the ones believing in him might have permanent life.4 But those who do not believe will be condemned. Jesus did not go into detail with Nicodemus about the nature of that condemnation, but Nicodemus knew the fate of those Israelites who did not look in faith at the desert snake. They rejected the remedy. They died. They never made it to the promised land. Then, we looked at the words of John 3:31-36, where we discovered there are two kinds of people. There are the believers (ὁ πιστεύων) in Christ, and the rejectors (ὁ ἀπειθῶν) of Christ. Only the believers will receive permanent life (ζωή αἱώνιος). The rejectors await God’s wrath, which will destroy them. The next time we encounter ζωή, Jesus is having another one-on-one conversation. He is at Jacob’s well in Sychar of Samaria, and he sits at the well for a mid-day rest, and a drink of the water. A Samaritan woman approaches, and he asks her for a drink. The woman was actually surprised at the request, because Jews from other regions of Palestine made a point of avoiding Samaritans. The first thing Jesus says in response to her surprise is “if you knew the gift of God…” John had already identified the idea of the Messiah being a gift given by God as a major theme of his Gospel. The Messiah was to give believers the right to become children of God.5 He was to give grace and truth.6 John explained that his prophetic gift comes from heaven.7 But that Jesus speaks the very words of God, because God has given him the Spirit without limit.8 Jesus is the Son, whom the Father loves, and has given all things into his hand.9 He himself is God’s love gift, to be lifted up for people to believe in, so that they do not perish.10 So, John wraps up all of his “gift” ideas in the person of Jesus. Here’s where it gets interesting. 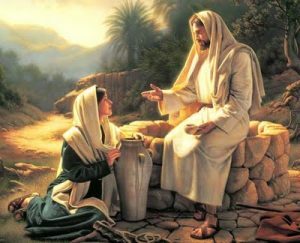 Jesus tells this woman that she could have asked him, and he would have given her something called “living water” (ὕδωρ ζῶν).11 The word “living” is a participle form of the verb ζάω, which corresponds to the noun ζωή. This is the first time we encounter the verb in John’s Gospel, but (as we have already seen) the noun has served as a marker for another major theme for John. Jesus is talking about that permanent life (ζωή αἱώνιος) that he had mentioned to Nicodemus. John frames his soteriology (doctrine of salvation) using this phrase. Now, we have an advantage over the woman at the well, because we have already read John 3, but she has not. She does not have any of the background that I just mentioned. The only water she knew about was the water in that well, and she could see that Jesus did not even have a bucket with him. Even Jacob — whom she considered their mutual ancestor – needed to dig that well, and draw water from it. Jesus was not at all ashamed of this woman’s response to him. He wanted her to tell him where she was. That would give him an opportunity to share what he had to offer. He offered her a drink of the well, which was himself. He assured her that if she took a drink from him, she would never thirst again. I should not have to remind you that this woman was a sinner – and a notorious one. She did not qualify to drink of the waters of the well of permanent life by virtue of her holiness. The woman wants to avoid the real subject, so she falls back into an old controversy about worship, where the best place to worship is. The Samaritans had taken up the opinion that Mount Gerizim was the best place to worship since it had been the mountain where the Israelites had pronounced God’s blessings upon the obedient.13 The Samaritans believed that God had met with Abraham here. Jesus answers the woman’s questions about where the best place to worship is,14 so, she tries to avoid the real subject again by saying that when the Messiah comes, he will set everyone straight. That’s when Jesus makes one of his earliest declarations of his own true identity. He tells the woman “Ἐγώ εἰμι.” Those two words were the same that God used to identify himself to the patriarchs. When the disciples saw Jesus walking on the water, he told them “… “It is I. (Ἐγώ εἰμι) Don’t be afraid.”20 When the unbelieving Jews questioned him about his relationship to Abraham, he told them “Truly I tell you, before Abraham was, I am (Ἐγώ εἰμι).”21 When Judas came with the soldiers seeking to arrest Jesus, he told them “Ἐγώ εἰμι” — at which statement, they collapsed backward and fell onto the ground.22 When Paul was having his Damascus road conversion, and asked who it was who was speaking to him, Jesus said “Ἐγώ εἰμι Ἰησοῦς” (I am Jesus). Jesus did not tell the woman at the well any of those things about himself that day. But he did tell her what she needed to know. He is the source of the living water that led to never thirsting again. He is the source of permanent life. She believed this truth that day, and brought her village to meet Jesus. She had been set free that day, and committed herself to the new task of supplying others with what they are thirsty for. 22John 18:5-6 (see also 18:8). 23John 6:35 CSB (see also John 6:41, 48, 51). 24John 8:12 CSB (see also John 8:18,24,28). 25John 10:7 CSB (see also 10:9). 26John 10:11 CSB (see also 10:14).